In the mid-90s, a new genre of R&B emerged that combined hip hop with old school soul that harkened back to artists such as Marvin Gaye and Donny Hathaway. No one personifies this neo-soul movement more than Erykah Badu, a singular talent who blends her Billie Holiday-tinged voice with hip hop beats, poetic lyrics calling for black pride, and an artsy, bohemian image to create an organically soulful mix. Her debut album, 1997's Baduizm, signaled the arrival of an artist who respects the past but lives very much in the present. 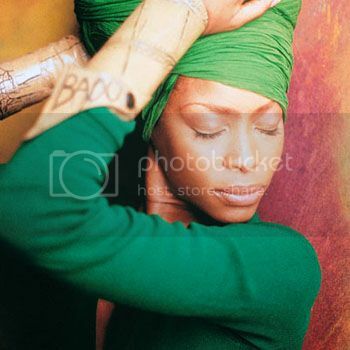 While "On and On" became the album's best-known hit, followed by the ballad "Next Lifetime," it's "Otherside of the Game" which effectively showcases Badu's debt to jazz as well as soul. Typical of Badu's deeply personal lyrics, "Otherside of the Game" tells the story of a conflicted woman in a troubled relationship. She is expecting a baby with her husband, so she feels she must stand by him despite his apparently illegal activities. As soft bass, keyboards, and a gentle beat introduce the song, Badu immediately gets to the point: "Whatcha you gonna do when they come for you/ Work ain't honest but it pays the bills," she croons. As the band subtly backs her with jazzy chord changes and strong bass lines (played by none other than jazz legend Ron Carter), her sometimes fragile voice emotionally conveys the narrator's dilemma. "I know you got to get your hustle on, so I pray/ I understand the game sometimes/ And I love him strong but..." At other times, Badu takes on a world-weary tone, defending her spouse's questionable decisions. "Now, me and baby got this situation/ See brother got this complex occupation/ And it ain't that he don't have education/ 'Cause I was right there at his graduation." While she seemingly accepts this situation, she admits that "it's me and baby that he hurts." Throughout the remainder of the track, Badu scats and ad-libs lines alternately supporting her husband and defending herself. "See I ain't trying to run your life/ But I want you to do what's right," she sings. One of the most intriguing lines of "Otherside of the Game" reflects apprehension, a sense of ambivalence about how far society has grown. "Peace out the revolution/ But we paid though." She lets the thought linger, allowing listeners to arrive at their own conclusions. This is a key Badu trademark: she writes sometimes cryptic lyrics that force listeners to think and self-reflect. After Baduizm's great success--it was Grammys for Best R&B Album and Best Female R&B Vocal Performance for "On and On"--fans expected Badu to continue on the neo-soul path. She did release a live album in 1997, a risky move for a new artist with only one album to her name. But it too proved to be a hit, though she demonstrated her love for 70s soul rather than strictly jazz. Subsequent releases strayed even father, however, delving into funk, rock, and politically charged lyrics. Badu has forged her own path and distinctive--at times eccentric--image with albums such as Worldwide Underground and New Amerykah Part One (4th World War). She did return to her jazzy roots somewhat on 2010's New Amerykah Part Two (Return of the Ankh), managing to make a 1979 Paul McCartney and Wings song, "Arrow Through Me," sound funky by sampling it on her track "Gone Baby, Don't be Long." Badu may frustrate some fans with her artistic twists and turns, but her role in establishing the neo-soul movement cannot be denied. Listen to "Otherside of the Game" and other Baduizm tracks by lighting some candles and incense, reclining in a chair, and losing yourself in Badu's expressive voice. A couple of notes about the video below: Badu's husband is played by André 3000 (better known as one half of Outkast), her then real-life lover and father of her child Seven Sirius Benjamin. At one point, "Other Side of the Game" fades into another track, "Rimshot," also from Baduizm.